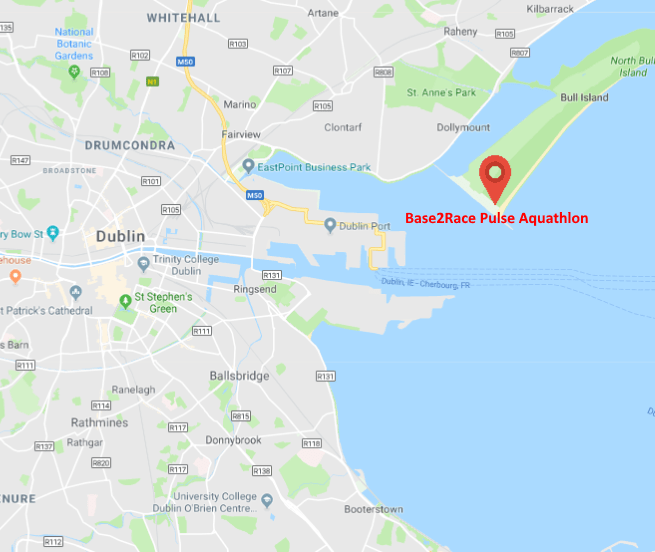 The Pulse Aquathlon Festival will host this year’s Triathlon Ireland Aquathlon National Championships at the North Bull Wall, Dublin on June 16th 2018. The entry fee is non-refundable, however you may transfer your entry to another athlete up to one week before race day. The aquathlon takes place at the North Bull Island near Clontarf. 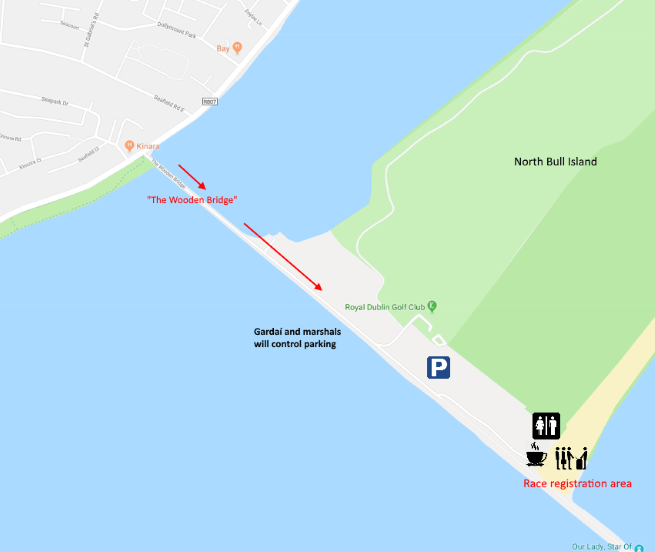 Race start and registration will be from the North Bull Wall and the beach car park beside it. You access the North Bull Wall via the Wooden Bridge off the Clontarf Road. From Dublin City Centre, the nearest outward bound bus stop for Bus No. 130 is 1752 (Clontarf Rd, Seaview Point). If returning to the City Centre the nearest inbound bus stop for the 130 bus is 1727 (Clontarf Rd, Kincora Road). Parking will be available in designated areas along the North Bull Wall. Limited parking will be available in the car park on the beach, where race registration is located. We encourage people to use public transport or car pool where possible. Gardaí and marshals will be on site to guide you to a parking place. Please obey our marshals, they are there to help you. 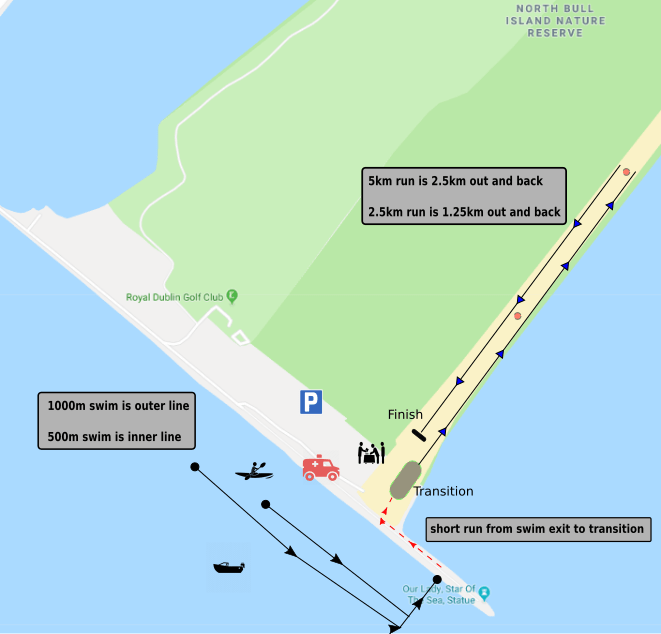 The aquathlon consists of a swim parallel to the North Bull Wall, followed by a run along Dollymount Strand. Swim and run distances will vary depending on the event category that you are racing in, the map below provides an overview of the course. There will be three portable toilets near the registration area. Additionally, coin operated public toilets are located close to the beach car park. Refreshments and snacks will be available from the Last Lap Café snack van in the registration area. There will be a bag drop area beside Transition. Marshals will monitor the this area, however we will not be liable for any property illegally removed from the area. Do not leave any valuables in your bag. In the unlikely event that we have to cancel the swim leg due to adverse weather, Pulse Triathlon Club reserves the right to change the race to a run only event. Feel free to contact us at race@pulsetri.com. Feel free to contact us at race@pulsetri.com. Thank you to the Dublin Port Authority, Dublin City Council, Dollymount Sea Scouts, Dublin Civil Defence, Howth Coastguard, and An Garda Síochána.